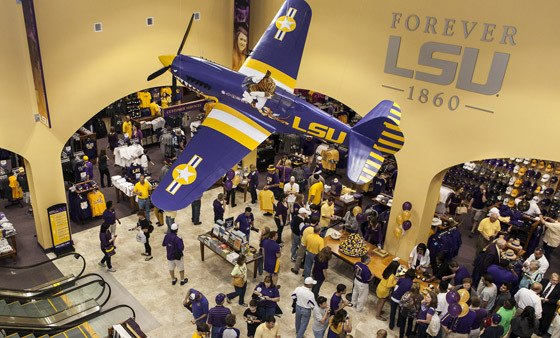 A Curtis P40 Flying Tiger aircraft soars above customers at the new Barnes & Noble at LSU superstore at Louisiana State University, acknowledging LSU’s proud “Ole War Skule” military tradition. Not even an unplanned stopover from Hurricane Sandy could dampen the enthusiasm for last month’s official debut of the new Barnes & Noble at LSU campus superstore at Louisiana State University (LSU). The planned debut of the new store segued into a two-week long ‘event a day,’ beginning October 22, and included a cavalcade of trick-or-treating events, author signings, samplings and grand-opening sales as a build up to the revised opening celebration. The new spacious Barnes & Noble at LSU bookstore features indoor and outdoor plaza seating, a cafe serving Starbucks, and a second floor with a computer and technology center. As a long-time planned joint venture between Barnes & Noble College and LSU, the new superstore has quickly become an integral part of the campus. 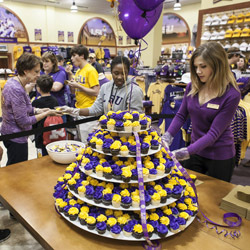 Patrons were served “love purple, live gold” cupcakes at the grand opening celebration of the Barnes & Noble at LSU campus store. Providing greater space for merchandising and customer seating within the dramatic store design, the new superstore offers an expanded café for nearly one hundred people and an extensive menu to include more fresh food items. 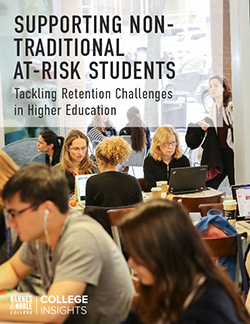 Previous limitations to the store’s textbook reservations process have been reworked to now include online ordering and three service counters where reservations can be accessed and fulfilled without waiting. Seating 65 people and providing full audio visual facilities, the store’s event room will be the new venue for prospective student tours with an LSU presentation and the opportunity to talk about the store’s resources. 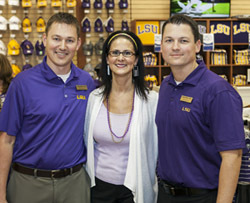 Barnes & Noble at LSU campus store management: left to right, Assistant Manager Whit Green, Regional Manager Andrea Lipman and General Manager Paul Stevenson. Stevenson points to a robust schedule of author visits, cooking demonstrations and community events designed to do just that. 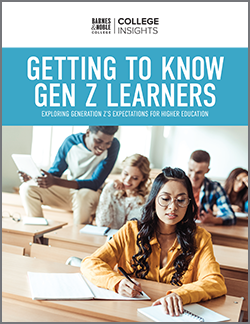 He also maintains that he wants to be able to offer his customers an experience; from dropping in for a cup of coffee, to using the tech center, to simply reading in front of the windows in one of the store’s plush chairs. “It’s always going to be what happens in the store and the level of customer service we’re able to offer that really counts,” he says.